In the previous post, I described a new value chain that will connect companies providing on-demand mobility and three emerging models for the realization of this value chain. This value chain is the result of the consumer shift from a car ownership-centric transportation model to a hybrid model that blends car ownership with mobility services, and the stated intent by the providers of certain of these services to adopt of Autonomous Connected Electrified (ACE) vehicles. A corresponding value chain, that we will examine in future posts, is being developed around the application of ACE vehicles in various forms of logistics. 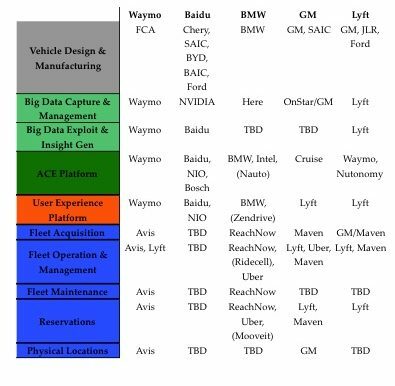 Various acquisitions, partnerships, and investments by automotive industry incumbents and by companies that already provide on-demand mobility services, or intend to do so, including the recently announced partnerships between Waymo and Avis, and Apple and Hertz, indicate that this value chain, which I call ACE mobility services value chain, is starting to quickly materialize. In this post I provide a deeper analysis of the emerging value chain in the process exploring investment opportunities in tomorrow’s leading businesses. In my book The Big Data Opportunity In Our Driverless Future I identify two distinct value chains that have been established because of the car ownership-centric model that has been dominant for the past 70+ years: the vehicle manufacturing and sale value chain, and the vehicle use value chain. The ACE mobility services value chain is an emerging third and is the result of the growing adoption of shared mobility. Establish where economic value exists, where it is decreasing, and where economic value can be created through the development of new solutions and business models. For example, controlling the autonomous vehicle AI-based platform, such as platform developed by Waymo, will be very important and will provide benefits similar to those recognized by Microsoft and Apple because they controlled the operating system of personal computers. Determine how transportation incumbents, and particularly automotive industry incumbents, will need to reconfigure their existing businesses, and what types of new businesses they will need to set up in order to fit into the new value chain. Though such analyses one can identify the opportunities for incumbent disruption, and the areas that will experience margin compression and become unattractive businesses. For example, small-batch vehicle manufacturing will become extremely important in order to cost-effectively offer ACE vehicles used for on-demand shared mobility, whereas the manufacturing model used today by automakers will prove less viable. Identify opportunities for new partnerships, investments, and acquisitions. For example, will venture investors receive a quicker ROI by funding startups that are addressing the consumer on-demand shared mobility use case, or the use case of offering better logistics through the use of autonomous trucks? Appreciate the complexities associated with global deployments of ACE vehicles (passenger or trucks) and be in a better position to craft strategies for such deployments. Measure the impact of other industries, such as energy and utilities, financial services and insurance, on this value chain. The ACE mobility services value chain requires expertise in one or more of the following areas: 1) Vehicle Design and Manufacturing, 2) Big Data acquisition, management and exploitation, 3) ACE Platform, 4) User Experience Platform, and 5) Fleet Operations. Fleet operations itself consist of several sub-disciplines: fleet acquisition, fleet operation and management, fleet maintenance, reservations, and the management of the physical locations where maintenance is performed. The vehicle’s design and manufacturing. The personalization of the vehicle’s cabin for each passenger, and the driver in the case of vehicles offering Level 4 driving automation. The creation of personalized ground transportation solutions. The management and optimization of fleet operations. The better utilization and optimization of transportation infrastructure. Fleet maintenance is already emerging as a major issue for ride-hailing companies. Areas such as fleet financing, fleet leasing, and fleet insurance, that currently I consider as part of fleet acquisition and fleet management, may eventually prove critical and need to be called out separately. It is also important for the companies participating in certain parts of this value chain to have broad know-how about transportation regulation so that they can understand how changes in regulations may be affecting them, as well as what regulations will need to be enacted in order to effectively use ACE vehicles to offer on-demand mobility services globally. Whereas the automotive OEM dominates the first value chain, the Fleet Operating Company (FOC) will dominate the new value chain. It will own the relationship with the customer, understand in detail the customer’s transportation and logistics needs through continuous big data exploitation so that it be in the position to anticipate them and address them, and will control the fleet of ACE vehicles (under lease or direct ownership) providing the transportation and logistics solutions. To erect sustainable barriers to entry and build high-margin businesses the FOC may also need to control technology-related intellectual property around the ACE and Passenger Experience platforms that define ACE vehicles and enable the provision of on-demand mobility services. While the new value chain is not expected to supplant either of the other two for the foreseeable future, it will definitely disrupt and alter them in major ways. New part suppliers for ACE vehicles will emerge in leadership positions, e.g., NVIDIA, Samsung, or Intel together with Mobileye, which it recently acquired. Along with the decreasing role of automotive OEMs in this value chain, the role of dealers, gas stations, parking garages, repair shops and several other businesses in the two established value chains will diminish. By analyzing the areas of expertise of companies that want to play a leading role in next-generation mobility we can identify high-value, short- and long-term opportunities for startups, as well as predict areas where new partnerships and acquisitions are likely to occur. We consider three types of companies that in these early days have shown that want to play a leadership role in the emerging value chain: incumbent automotive OEMs, e.g., BMW, Transportation Network Companies (TNCs), e.g., Uber, and Internet companies, e.g., Google/Waymo. 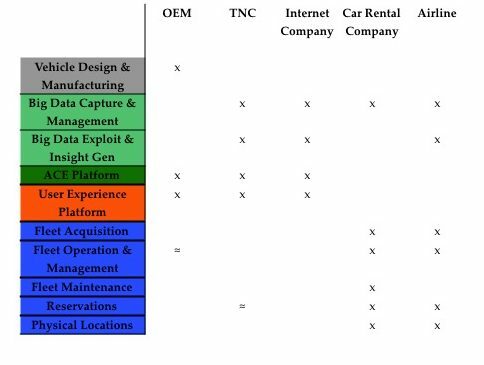 Table 1 summarizes the types of expertise that OEMs, TNCs, and Internet companies possess across the ACE mobility services value chain, consistent with the three models presented in the previous post of this series. Within the next 5-10 years we will see larger scale deployments of ACE vehicles particularly for on-demand mobility services. Based on their already established areas of expertise companies intending to play a role, and more specifically a leadership role, in this value chain must make strategic decisions. Among other issues they must determine which areas of expertise they will need to develop and which to access through partnerships, investments, and acquisitions. The ACE Platform and the User Experience Platform are key components of ACE vehicles. In addition to making ACE vehicles possible, together these platforms offer important business opportunities because they provide key differentiators in mobility services that can be delivered through ACE vehicles. For example, consider the business opportunity around providing transportation for the elderly. In the US alone by 2030, as autonomous vehicles are expected to be moving from large trials to broad deployments, there will be over 70 million people in the US over the age of 65. The ACE Platform controls the autonomous operation of the vehicle (passenger vehicle or truck). It consists of the hardware, e.g., sensors, software, e.g., AI applications for image recognition, communications, e.g., broadband communication systems that connect clouds, vehicles and transportation infrastructure, and data, e.g., sensor data, high definition digital maps, that make autonomous vehicles possible. Several incumbent and newcomer automotive OEMs, such as BMW, Tesla, and Nio, suppliers such as Delphi, and Bosch, Internet technology leaders such as Google/Waymo, Apple, and Baidu, TNCs such as Uber, and many startups are developing competing ACE Platforms either independently or in partnership. For example, Mercedes and Bosch have partnered to jointly develop an ACE Platform. Other OEMs, for example GM and Ford, have acquired such platforms (Cruise, and Argo respectively). The User Experience Platform controls the in-cabin experience. It consists of the hardware, e.g., infotainment system, software, e.g., telematics, AI applications for cabin personalization, and data, e.g., infotainment content, passenger preferences, that address passenger needs while traveling in ACE vehicles. A corresponding platform can be developed for autonomous logistics vehicles. The Passenger Experience Platform may be split between components running on the vehicle, the cloud, and the passengers’ mobile devices. For example, Uber’s customer application is an early example of an Intelligent Passenger Platform running exclusively on smartphones. Large companies such as Audi, Tesla, SiriusXM, Harman, Google and Apple, as well as many startups, e.g., Mojio, are developing either complete versions of this platform, or individual layers of the stack. It is not yet clear how the companies that want to participate in the ACE mobility services value chain will choose to do so but a period of broad “experimentation” has already started. During this phase, in addition to growing internal development efforts, we are seeing investments in and acquisitions of startups, as well as conventional and unconventional partnerships around innovative technologies and business models. For example, Waymo uses FCA’s vehicles where, for the time being, it incorporates its proprietary ACE Platform. Lyft will use GM’s vehicles that incorporate Cruise’s ACE Platform, a company GM acquired. BMW has invested in a variety of startups from Zendrive (driver analytics), to Nauto (ACE Platform), Ridecell (fleet management), Moovit (multimodal transportation reservations), and Chargepoint (electric vehicle charging stations) among several others. Airbus has started experimenting with personal mobility drones as it considers entering the mobility services market. However, as we see in Table 1, each of the three company types that are actively working on this value chain is missing key areas of expertise. Expertise on placing orders for vehicle fleets (they order about 2M new vehicles every year from OEMs). However, despite the large number of vehicles they order they are still not able to customize the designs of these vehicles because of the automotive industry’s scale-based manufacturing model and the pricing pressures it imposes. Expertise of how to manage and maintain such fleets over many locations. This, of course, doesn’t mean that the fleet management software systems rental companies already use will be sufficient to address the needs of on-demand mobility fleets. New software will need to be written from scratch, presenting opportunities for startups like Ridecell and Bestmile, but the experience contributed by car rental companies is valuable nonetheless. The physical locations to park, support, and maintain vehicles, as well as offices and call centers to provide services to consumers. Global reservation systems. These systems will also need to be expanded to deal with the type of reservations on-demand mobility services require in order to take advantage of the customer and vehicle-related insights that can be generated from big data exploitation. Similarly, airlines contribute important expertise in big data exploitation, fleet acquisition, as well as fleet operations and management. It is interesting to note that airlines have better big data exploitation and insight generation capabilitiesthan car rental companies. Table 2 summarizes the areas of expertise car rental companies and airlines contribute to the ACE mobility services value chain. Both car rental companies and airlines have long experience and know-how addressing transportation regulatory issues and dealing with federal, state, city and international governments regarding such issues. This experience will be extremely important while establishing the right next-generation mobility businesses and in addressing existing regulations that can provide obstacles to the rollout of high-value services, as well as provide input to new regulations being considered by various governmental entities. While estimates (here and here) vary greatly, the next-generation mobility market, driven by autonomous vehicles and on-demand mobility services, is expected to be very large. Sensing the size of the market opportunity, automotive OEMs, global TNCs, and large Internet conglomerates are already working to stake their positions in the emerging value chain. In addition to internal product and mobility solution development these companies are aggressively acquiring, partnering, and investing in established companies and startups. Table 3 below provides some examples of this effort to work across this value chain, using models I previously described. While Table 3 is not meant to be exhaustive, e.g., companies like Mercedes, Delphi, and a few others have not been included, not every incumbent automaker, Tier 1 supplier, large TNC or Internet company would want to have a leadership role across the entire value chain, even if they may choose to have some role, e.g., Nissan, Faurecia. Large companies are willing to experiment with startups but also with other large companies. For example, see the startups where BMW has invested and with which it is working/experimenting (shown in parentheses). Many of these experiments will be small scale and will not be followed by larger deployments, even if they receive oversized publicity; a fact that startups should keep in mind as they consider business relations with large corporations. Corporations have not figured out all aspects of this value chain, as demonstrated by the TBD entries in the table. In some areas there is ambivalence leading to hedging, as demonstrated by what Lyft is doing regarding ACE Platform (Waymo, GM, and Nutonomy), Baidu is doing about vehicle design and manufacturing (Chery, SAIC, BYD, BAIC, Ford), and GM is doing with regards to fleet operations and management (Maven, Uber, Fleet). The pace of activity around the ACE mobility services value chain will remain high for the foreseeable future as ACE vehicles move from experimentation, to larger scale trials, and ultimately to commercial deployment. Companies, including startups, which want to be part of this value chain, must clearly understand where their expertise and Intellectual Property will provide them with the best possible and enduring advantage. In the process they will need to establish a clear strategy about where to invest, what amounts and at what pace, who to partner with, and which company to acquire or be acquired by. The establishment of the right strategy will be particularly critical for companies that want to become market leaders in next-generation mobility. Many of the areas that today witness an investment frenzy will take longer to mature requiring more capital than originally expected, while others may ultimately not prove as strategic as initially envisioned. Yet others may emerge as more strategic and critical than thought of today. During this early period, the larger corporations will continue to experiment with as many alternative strategies, technologies, and business models as possible. Startups and their investors will need to keep this in mind as experimentation should not be confused with scaled deployment.